Tracee Ellis Ross always brings her style game on & off the carpet. Yesterday evening(May 16th) she attended the 2017 ABC Upfront at the David Geffen Hall in Lincoln Center in New York. On tune with the red carpet, she wore head to red which featured a RYAN ROCHE FALL 2017 peplum midi dress, an EDIE PARKER clutch and CHRISTIAN LOUBOUTIN crisscross straps pumps. Tracee's dress also featured cut-out sides which added a sultry touch to her look. While her look is matchy matchy, she owns it and I thought she looked great. IRENE NEUWIRTH earrings and a matching red lip finished up her look. 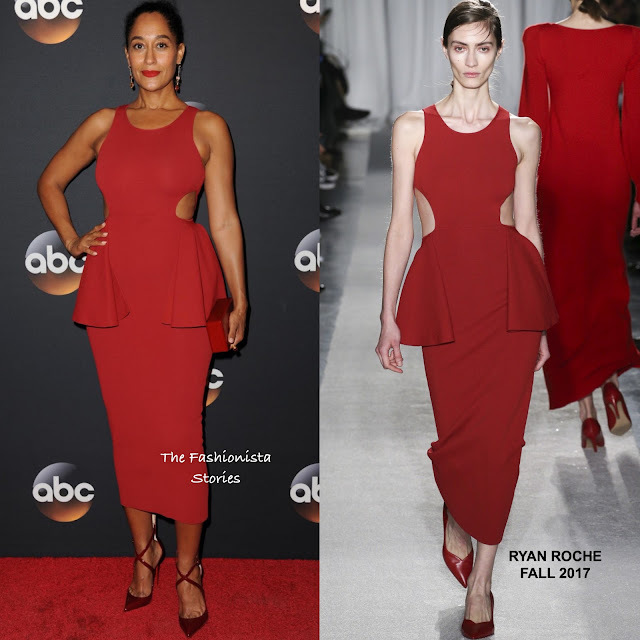 Did Tracee sell you on her red look?